If you plan to leave your rented flat or prepare your property for the next lodgers, you can use our professional end of tenancy cleaning services. They will ensure the spotless and hygienic condition of the rooms in the flat or house without the hard cleaning work. Our cleaning staff will provide the needed cleaning procedures to remove the dust, grime, stains and soiling from every room and area. We guarantee you that you will receive your rental deposits if you order the end of tenancy cleaning which we provide to the residents of Maida Vale. Our services are suitable for landlords, estate agents and tenants. The cleaners in our company will arrive in the expected time and start work. They will scrub and polish the inside and outside surfaces of the cooking appliances, fridge, washing machine, dishwasher, sanitize the sinks and taps. They will vacuum clean, mop and wipe the floors, remove the dust and stains from the wooden furniture and electric appliances. Our cleaning staff will disinfect the bathroom and toilet, remove the lime-scale from the sanitary ware. They will spend more time in the more soiled rooms and areas like hallway, bathroom and kitchen. You can rely on our company, located in Maida Vale to provide the qualitative and thorough end of tenancy cleaning which you need. If you are a property owner or letting agent and you want to make the flat which you offer for rent to look better and attract more customers, use our professional help. 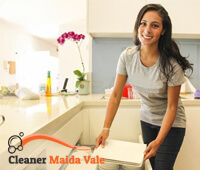 The end of tenancy cleaning which we provide in Maida Vale will guarantee you perfectly clean rooms which will be rented fast and preferred by more tenants. Our services are also appropriate for lodgers to ensure the receiving of their deposits.